Ginger is such a big part of our diet that I always have dry ginger at home for using it in home remedies and in cooking. I love ginger biscuits made with fresh homemade ginger powder and my whole family loves dry ginger and we consume it in the form tea, delicious ginger biscuits, dry ginger milk, etc. Dry ginger powder made with organic ginger has a beautiful smell and sharp taste that can never be got with ordinary dry ginger powder. We cannot get organic, good quality dry ginger powder here so I always try to make my own dry ginger powder with organic fresh ginger. 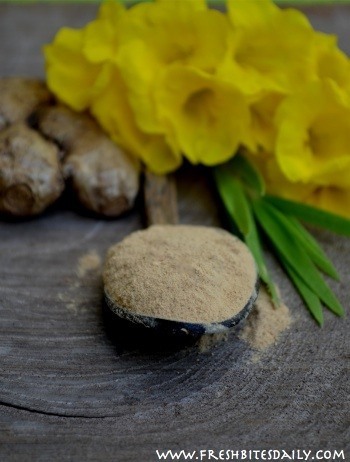 Dry ginger powder can be made easily at home and it smells so fresh and inviting that you will feel like using it often. I prefer to make small batches of dried ginger and store it in a airtight box, this way the ginger powder retains the freshness longer. Many people peel off the outer skin of ginger while making the dry ginger powder, but traditionally, it was always made with the peels and I continue to do so. 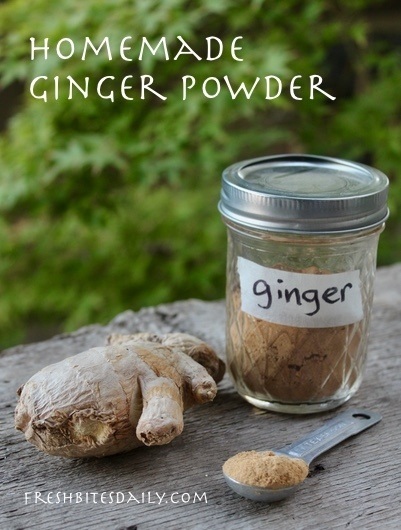 To make the dry ginger powder, take fresh ginger and soak it water for a few minutes to get rid of the dirt and wash it well under running water. Use a sharp knife and cut the fresh ginger into small pieces. The trick to making dry ginger powder fast is by cutting the ginger into very small pieces, so cut as small as you can and spread it on a plate. Here in India, we get plenty of sunlight and we always prefer to sun dry. I love sun drying the ingredients and since I live in a village, there is no traffic pollution or air pollution. If you are living in a city and you can’t dry it in the sun, try drying it out in the oven or in a dehydrator. Once the dry ginger is completely dry, powder it finely in a dry mixer or blender, put it through a sieve, and spread the mixture on a tissue or a plate to cool down completely and store in an airtight box. If you have large bits remaining in the sieve, powder that and run it through the sieve. Repeat until all of your ginger is powdered. If your ginger doesn’t dry completely “crispy,” use the freezer trick Jeanie mentions for making homemade tomato powder (here). Freeze your dried ginger to harden it before powdering. There is a simple trick for selecting the best ginger. First, buy organic ginger root and, second, when buying ginger try to snap a small piece. It should snap cleanly into two, without any fibers in between. If the ginger has a lot of fibers, it will not grind smoothly into a powder. Also in my personal experience, fresh ginger that cleanly snaps has the best flavor. Take fresh ginger root in a bowl and soak it in water for 3 to 4 minutes and wash nicely under running water to remove the dirt completely. Cut it into small pieces using a sharp knife. The smaller the pieces, the faster it will dry out. Dry the dry ginger spread on a plate either under hot sun or in a dehydrator. Once completely dry, use a dry mixer or food processor to grind the ginger into a fine powder. For many, the smell of dry ginger will make them think of warm ginger bread or biscuits and I am no exception. But we can’t be making ginger bread daily and we only make these treats once in a while, but to consume dry ginger on a daily basis, we can make dry ginger tea. To make the tea take around less than 1/4 tsp of dry ginger powder in a bowl and add boiling water to it. You can also sweeten with honey, if you prefer. Here in India we use whole dry ginger and pounded coriander seeds for making the tea and we sweeten it with palm candy. You can also make dry ginger milk by mixing dry ginger powder in whole organic milk along with sugar, this is one of my favorite drinks and here in India, it is very popular and is usually served as a dessert in most of the weddings. In India poultice made of dry ginger is used for treating arthritis for many years. It is such an effective home remedy. Dry ginger has anti-inflammatory properties that fights arthritis pain. Research is backing up this. We usually take a piece of dry ginger and rub it along with little water to get a thick paste. Dry ginger rubs into a paste easily, but you can also make the paste with dry ginger powder. Take the required amount of powder in a bowl and add water to mix into a thick paste and apply over the affected area. It will burn initially when applied, but later it will form a thick coating. 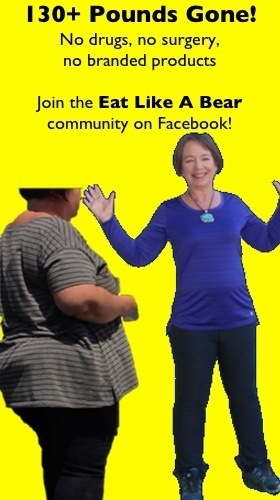 You can wash it off, once the poultice is dry. To combat indigestion, use your dry ginger in a tincture. To make the tincture, take a cup of unflavored vodka and mix it with 1/2 teaspoon of ground dry ginger powder and pour it into a dark colored bottle, cork it tightly, and leave it for about 45 days in a dark place away from sunlight. After 45 days, strain it and store it in a new bottle. For adults, 10 drops with a bit of honey will settle the digestion. Making your own ginger powder is simple with these key techniques. Cut it into small pieces using a sharp knife. The smaller the pieces, the faster it will dry. Spread the ginger on a plate and dry in the hot sun or in a dehydrator. Once they are completely dry, grind the dried ginger in a blender or food processor until it becomes a fine powder. Sieve the powder and return any chunks to the food processor to grind into a finer powder. Allow the ginger powder to cool. Store in a jar with a tight-fitting lid.